This massive collection of modules clocks in at 192 pages, 1 page front cover, 1 page editorial, 1 page ToC, 1 page SRD, 11 pages of advertisements, leaving us with 177 pages of content, so let’s take a look! This pdf kicks in with a blast from the past for me – a discussion on the upcoming Lost Lands setting and how different places in the world implied by all Necromancer Games/Frog God Games modules and supplements. If you’re like me, this is damn interesting…but let me go back for a second. When 3rd edition came around back in the day, I was kind of skeptical – but then again, after seeing the very real limitations rules-light systems can sport at one given point, I converted – also due to my players simply enjoying reaping the benefits of system mastery. So I went into the new system, bought books etc. – the whole deal. That is when I realized that balance was terrible and fluctuating – if you’ve been there during the “Sword and Fist”-era, you’ll know what I mean. At the same time, I got modules and while there were some fine gems, WotC just didn’t produce enough – and while I will never forget how my PCs defeated Ashardalon (upgraded to CR 38, epic etc. ), most, but not all of the new school modules left me craving *something*, feeling like something had been lost in the process. It took me quite some time back in the day to grasp what the problem was – in the advent of massive statblocks, the things that provided the immersion into the world took a step back. In its place came very straight: “This is treated as spell x” descriptions that made the whole system more concise. Additionally, bestiaries went away from complex discussions on habitat, ecology, etc., instead providing almost only crunch, rendering books I used to love to read into something I read once and then used at the table – but never read for pleasure. The increased size of statblocks also rendered modules simply less detailed – less space to devote to the respective areas and inhabitants, their tactics etc. While this changed over the course of 3.X and in PFRPG is less of a problem, mainly due to a vast array of superb modules, in 3.X’s days, it made me feel as if the system was superb in its math, but also soulless. Then there was the issue with player-entitlement, which also became a problem during those days – or rather, the slavish adherence to CRs and a “balanced chance” in every encounter felt to me unrealistic and soulless – it detracted immensely from my sense of immersion. On the plus-side, the OGL provided a whole bunch of interesting 3pps, so I was browsing shelves in my FLGS. I noticed two old-school looking modules there – “Crucible of Freya” and “Tomb of Abysthor.” I bought them. I read them. I cackled with glee. Here we got modules that had line-of-sight-featuring maps of guard-fires, great cartography – and the balls to throw a CR 6 troll at a 1st level party, proudly, defiantly against the zeitgeist, stating that PCs acting dumb ought to result in death. This very philosophy of proper challenges and smart, detailed surroundings was glorious. Better yet, the modules were not afraid of not codifying everything – providing unique terrain hazards, additional encounters (heck, in ToA the PCs can avoid a whole level if they don’t want to explore everything!). A couple of years later, I had almost everything Necromancer Games had produced and ordered every book I could get my hands on. Then, PFRPG happened and I was complaining about Slumbering Tsar, about how much I wanted to see it and had graduated from forum-lurker to reviewer. The rest is history. Additionally, it should be noted that this is no lazy repackaging – new encounters, mapped mini-dungeons, copious amounts of superb b/w-artworks – there’s a lot of new material and the inclusion of e.g. the APG-classes in builds does result in a very organic, defiantly pathfinder change of the basic modules. What about a misanthropic druid who has developed a wand to control stirges, for example, with a hilarious picture of the poor guy being annoyed by the bloodsucking pests. Ruined waystations and monasteries breathe a significant sense of danger and desolation. On the crunch-side, the book does sport new takes on archetypes and prestige classes for the foes, numerous magic items and a variety of non-standard creatures to be encountered within these pages. Editing and formatting are top-notch, I noticed no significant glitches. Layout adheres to a printer-friendly 2-column b/w-standard and the pdf comes fully bookmarked for your convenience. The b/w-artworks herein are glorious, especially the new ones; some original artworks have been used as well. The cartography is neat as well, I just wished we had player-friendly versions for them. I’ll make this short – Bill Webb and Clark Perterson are legends for a reason. But Erica Balsley, Greg A. Vaughan and Skeeter Green as contributing authors should be proud as well. Developers Skeeter Green and Ken Cliffe have taken this collection and made it more than the sum of its parts, rendering this book more than the sum of its parts. …and much more. Yes, a lot of PCs died. They still talk about the experience with a gleam in their eyes and when PC upon PC sacrificed himself to buy some time in my modified finale…well, let’s just say that this was simply glorious. If you’re interested in that, drop me a line. Back to the review: I have not SPOILER-tagged the module for a reason – this is less about the story, more about the atmosphere. About the feeling of this massive book. About the freedom, the non-linearity, the sense of danger and a world that has turned forward, a feeling that what little civilization is there, it’s in danger. This is a document of roleplaying game history, carefully and respectfully refreshed to the PFRPG-rules and one of the books that should grace the shelves of all PFRPG-DMs -beyond being a great old-school module, this constitutes the best iteration of the material so far, both in production values and builds. That being said, Frog God Games has since back in the day raised the bar by quite a bit, so while this module is still great and awesome, it has aged a bit when compared to some of the glorious modules FGG has produced in the meanwhile. And if your group has played the original modules, this may be the better version, but for me, personally, I wouldn’t play this massive array again and instead use the new content as supplemental wilderness encounters. What I’m trying to say is – if you already have the originals, this is optional, not mandatory. If you don’t have them, though – this is literally roleplaying game history. My final verdict will still clock in at 5 stars + seal of approval – this is a book that every group that liked old-school should have played at least once. 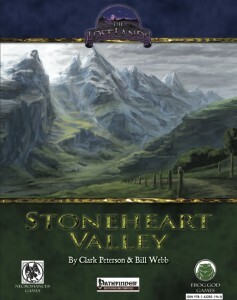 You can’t get this book currently on OBS or d20pfsrd.com’s shop – but here in Frog God Games’ shop.